This Muskoka girl is in sunny Florida at the moment and I thought I would share this with northern readers to warm you people up a bit. 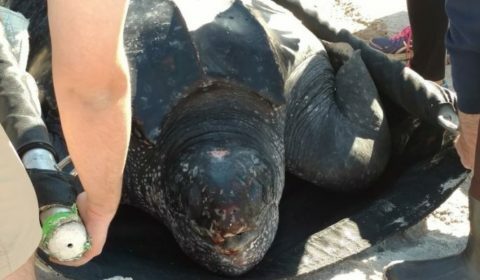 A dozen people helped lift this 670-pound rescue turtle back into the ocean Wednesday in Florida. This really made yesterday special. I was at the southern end of Amelia Island, at Peters Point, which is located in north Florida on the Atlantic side. Timing is everything. I had already walked a good stretch of the beach and was thinking of going home when a couple vehicles pulled up from Florida Fish and Wildlife Commission with lots of workers and volunteers. I asked the one fellow what was up and he replied they were doing a turtle release. This is worth missing supper I thought to myself. I kept firing questions at the volunteers and they told us this turtle was caught in a net in King’s Bay by Fort Clinch State Park. The net was used to help dredge up extra material so the channels does not get too shallow. If you think some snapping turtles can get pretty big in Ontario, you have not seen anything until you have seen this giant sea turtle. It is called a leatherback sea turtle (Dermochelys coriacea) and is the largest of all living turtles. Relatives of modern leatherback turtles have existed in some form since the first true sea turtles evolved over 110 million years ago during the Cretaceous period. It lacks a hard outer shell. Instead its carapace is covered by skin and oily flesh. Adults average three to six feet long in curved carapace length and can weigh betwee 250 – 700 kg. This particular one about 690 plus pounds. One volunteer was keeping its skin on its back moist with a spray bottle. Another volunteer was stroking its head. I kept talking to it and looking it in the eye and telling it that all would be well soon. A small crowd of people gathered. Finally, the turtle was lowered from the truck and at least 12 people helped to carry it on the stretcher to the seashore where the turtle entered the water and swam way out into the giant waves. Everyone cheered at that moment. It was a really happy ending.